FED-STD-595 and all associated slash sheets are canceled. AMS-STD-595 supersedes FED-STD-595. 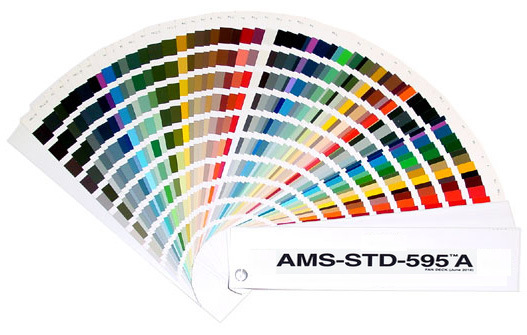 The Standard color system is issued by the the General Services Administration. It was introduced by the U.S. government as a color description and communication system.Fandecks are to be used for the purpose of general color representation only. This site is created and operated by Harzen. Harzen is an international reseller of fan decks and has no business relation with GSA/SAE. Harzen is not a distributor on behalf of GSA/SAE. Errors reserved. 2017. The standard is managed by the SAE. More information about the federal standard on www.sae.org. The fan deck is to be used for the purpose of general color representation only. Color calibration is to be accomplished via approved reference color chip. The colours depicted on the following chart are for guidance only. The displayed colour will depend on your monitor and browser and pearl or metallic colours cannot be shown adequately. The finished colour, therefore, may not be as shown here. Please use the official colour products for most accurate colour. Made with NVU.